We just witnessed one of the best WrestleMania of all time. WrestleMania 35 took place at MetLife Stadium, New Jersey. We finally got the winner of the most anticipated match in wrestling history, as The Man Becky Lynch defeated Ronda Rousey and Charlotte Flair to become the new Raw and SmackDown women's champion. WWE WrestleMania 35: The Demon Finn Balor Becomes the New Intercontinental Champion by Defeating Bobby Lashley. Becky's journey was not at all easy to this success. She fought against the odds and the management to finally climb up to the top. She was screwed by Mr.Vince McMahon, as she was replaced by Charlotte Flair for WWE World's Championship match at WrestleMania 35. In spite of winning the Women's Royal Rumble match, Becky Lynch had to prove herself again by fighting Charlotte Flair at Fastlane. 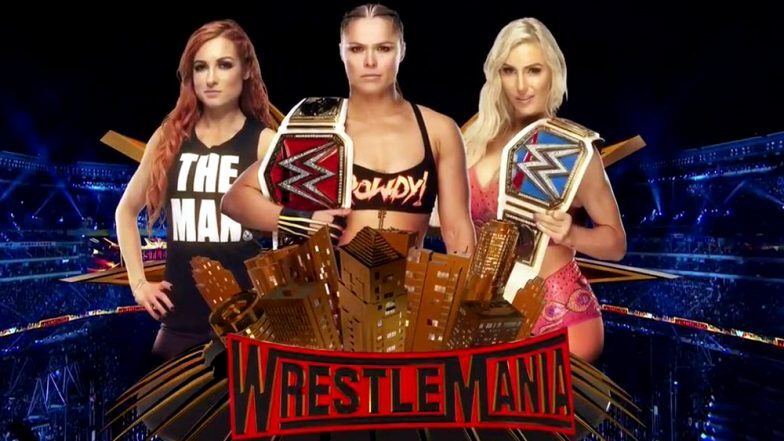 This match had a stipulation that if Becky wins, she will get added in the main event title match at WrestleMania 35. Becky emerged victorious at Fastlane PPV via disqualification as she was attacked by Ronda Rousey in that match. The recently concluded Women's title match at WrestleMania thrilled WWE universe as we saw tables get broken, multiple disarm bar submission move. The emotions of these female athletes were quite high in the match. However, Becky emerged victorious in the end by pinning Ronda to a three count. Becky Lynch thereby takes it all to become the WWE Women's Raw and SmackDown title together at the same time. This was indeed one of the best WrestleMania of all time. WWE universe finally has reason to smile as most of them wanted Becky Lynch to win the title at WrestleMania 35. It will be interesting to see how Ronda Rousey reacts in the upcoming RAW episode after getting pinned by Becky Lynch. Stay tuned to our website-Latestly for more updates and news from the world of wrestling.